The Basingstoke Café Scientifique meets on the last Monday evening of the month from 7.00pm to 9.00pm in The Tea Bar at 9-13 London Street, Basingstoke. You are welcome to arrive at The Tea Bar any time from 7.00pm onwards, but you are encouraged to arrive before the speaker starts at 7.30pm. 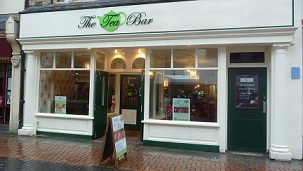 The Tea Bar is in the Top of Town pedestrianised area of Basingstoke near the Market Square and next door to the main Basingstoke Post Office. For those tempted to come by car, there is plenty of pay and display parking off New Road at the back of London Street. An evening parking charge of £1.00 applies in all town Centre pay and display car parks. Alternatively you can park in the Festival Place car park which is also £1.00 for the evening, but which is a pay on exit car park. Below is a map showing the location of The Tea Bar in London Street. Since the evening starts with a brief but crucial introductory talk, it is best to arrive on time – or earlier, to be sure of a comfortable seat. For those who would like to receive email alerts of coming talks, the Basingstoke Café Sci operates an email subscription list through the Meetup.com system that you can subscribe to for free. and click the join link ... and that is it!